After the late night of our naming ceremony on the evening of my first rest day, the alarm sounded early. I got up, packed my things, cleaned and disinfected my toes and knee and then we drove back to the point where I had left off running on Thursday. We hadn’t been able to find any food in town to have breakfast, so I had a Honey Stinger waffle and was on my way on only 180 calories for the morning. For the start of a new day after the rest, I put on a fresh pair of shoes – my Mizuno Mushas. I was sleepy and worried about my blisters, but they didn’t hurt very much. Yet my knee was quite stiff and achy and still hadn’t forgiven me the fall on day one. It was overcast and there was a slight breeze. This helps my running a lot. We had few stops as there were fewer villages along the way, so we made good progress. The knee stopped aching about 10 kilometers into the run. All systems go! When we did come to a village, a group of women came over to greet me and asked me how my family was. We all shook hands and they welcomed me to their village. Before I knew it we were at the half way point. In another village a boy started running with me and tagged along for a couple of kilometres wearing a smile on his face the whole time. In another village, a young mother was out by the road holding her baby in her arms. The infant boy, Moussa, was the first baby that didn’t cry in fright at the sight of this toubab. In fact, he even let me hold him and happily tested his toothless gums on the tube of my hydration pack. Surely there was a tooth breaking through soon. Since I was feeling relatively good and the temperature was more bearable today I decided to get an extra couple of kilometres in and finished the day at almost 32 kilometers. Over 150 kilometers had now been completed on the route to Banjul. Following some stretching and rest on the roadside, we began the long drive back to Jan Jang Bureh where we had accommodations for the night. A truck was broken down by the side of the road. We stopped to see if we could help. This is what people do in the Gambia. There was no question of driving by with the “that’s not my problem” attitude or relying on the fact that someone else will probably help. We gave the man a lift to the next village where he could find a mechanic. I then fell asleep in the car, completely exhausted, and slept until we got to our accommodation. I sat in the car while Pa Modou sorted out details. While I was waiting, three girls came up to me carrying their exercise book and a notebook from school. One girl asked me if I liked my job. She then wrote down my answer. Next she asked me what my job was – not easy to explain to a 7 year old who speaks English as a second language. But we managed and again she recorded my answer carefully with one of the older girls and myself helping her spell the occasional word. I saw in her exercise book that her homework task was to “practice with a friend”. The girls also wanted to know my name and I told them I was Bintou. I settled into my room and following a shower, I began drafting my blog report from the rest day. My room had air conditioning, so I was in heaven! I had not gotten very far in my writing when a voice called out: “Bintou!” I answered the door and there were my little girlfriends. I shared some of the cookies I had been munching on and we talked for a little while before I told them I had to continue working. I also wanted a nap desperately. But not 10 minutes later, they were back at the door, asking me if I wanted to join them to go to “the grave”. How could I say no to these sweet little girls? So we started walking and I again petted the dog laying lazily in the same shady spot where he’d been since our arrival. The girls took me to a graveyard to show me the tombstones. While walking, we looked for lizards, talked about monkeys, scorpions and snakes, which they apparently often see in their compound. We also talked about their favourite subjects in school. Back in the yard of our accommodation, we said our good-byes and I again said hi to the lazy dog. Then I finished writing my blog. By now the sun had set. In order to send my blog to Marc for posting, I had to go outside so I could get a network. I put a chair on the path to my room and began the painfully slow process of logging on. The lazy dog decided it was now cool enough to move and came over to me, tail wagging. I petted him and talked to him while slowly going through the various log in steps. He began to chew the USB key that connected me to the internet and then put his front legs on my lap to come closer for more love. He licked my arms, then went around behind me, jumped with his front legs on my chair back and shoulders and then began to pull my pony tail. Playtime! When the prayers were starting to be heard from the Mosque, the dog turned in the direction of Mecca, crouched down and started howling at the sound. I am sure it was the right direction, as Kebba was turned the same way saying his prayers. Some young boys came over to say hi and when they saw that I liked their dog they asked me if I wanted him as a present. The generosity of the Gambian people is just like that. I wish I could have taken this funny dog with the chewed off ears with me and to accept the gift from the boys, but can’t even imagine the amount of paperwork involved in something like this, so this dog will have to keep providing his entertainment to the boys right here. The Nova Scotia volunteers had now also arrived after their teaching day and we had a late dinner together. Then I again collapsed into my bed to rest up for day six. On this day, we found breakfast in town and then took on the 30 kilometer drive to yesterday’s end point. Once there, I got out of the car, stretching my tight hip flexors and hamstrings. Kebba again joined me for the first part of the run and after the usual morning team photo, we set off to shouts of “To Banjul” and “Banjul calling!”. Kebba stuck with me for a whole 15 kilometers today. Then Spiderman took over and kept me company for 13 kilometers. 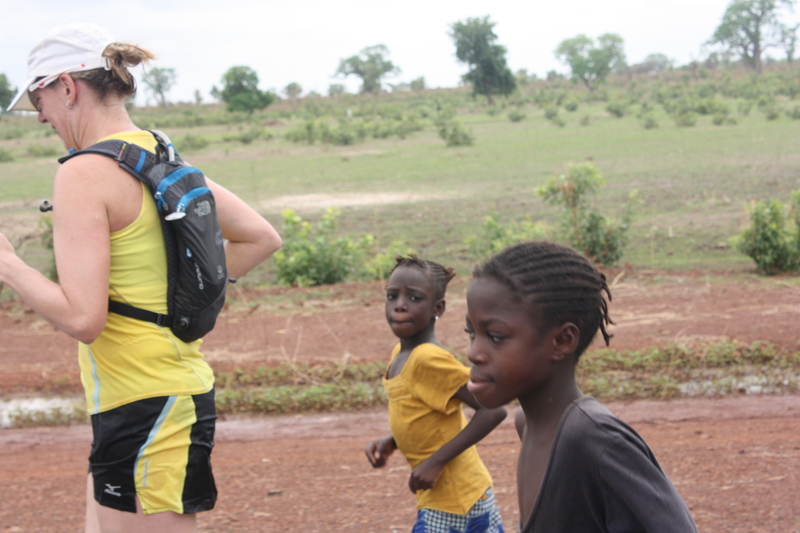 We stopped frequently today to speak to children, to run with a group of little girls. In each village, I would greet people with “Salaam Aleikum” or “Nmumbara, nmumbara” people waved and returned the greeting. Drivers of passing trucks, cars and motorcycles, as well as the mini bus taxis that were stuffed full of people and had loads of luggage and live goats strapped to the roof, would beep their horns and give a wave. I always rewarded the kids who ran with me with some candy and stopped at our car to give some to three young girls who had joined me. They then ran a little further with me and as I said my good-bye, they asked for another “sweetie” and I gladly obliged. As I turned to put the rest of the package back into the car, one of them called out: “Toubab!” and when I turned around, added: “Very good!” with a big smile on her face. It is these encounters with the kids for whom I am running that always get me through the day, no matter how tired or tight my body is starting to feel. Some boys herding cows admired my hydration pack at another stop. One of them had figured out that I was drinking from the tube and explained this to his friends in Wolof. I only guessed at what he was saying because he was pointing and gesturing. So, I decided to give them a demonstration, took a deep draught from the tube and then spat the water on the ground. The crowd erupted in laughter and I had to perform my trick a few more times. While on the road today, the guys picked up a woven grass mat and a small stool from an old man selling his wares by the roadside. Now I have a place to sit when I change my socks and shoes partway through the run and a better place than the floor mats from the car to lay down and rest after the run as well as to do some stretching. As I did so today, a group of children kept calling out to me, waving from a short distance away. Since they kept calling and smiling, I thought I’d walk over and say hello. This again prompted one little girl to run away crying. The scary toubab strikes again! This entry was posted in Charity Run and tagged Africa, children, Gambia, Love4Gambia, Mizuno, NSGA, The Gambia. Bookmark the permalink. Way to go Bintou! I’ve read all your posts and will continue to do so. I love reading about your incredible journey! You’re almost half way there!! Bintou, Toubab and Andrea you have a heart the size of the moon! I enjoy following your progress on the map as you run ‘towards’ the Ocean. It is terrific to read the stories of your interactions with the local families. By now you have probably passed the half way mark! Congratulations! I hope your run went well today. The pictures of you, your team and the children are wonderful!!!! So many things to see and think about. There seems to be so much sharing and helping others along your journey. Take care! May those children continue to fuel your gas tank during your running hours. Amazing. I so love reading your writing. Thanks for the updates on the boys’ kms run, tell them their first coach is very proud. And I had no idea that Spider was such a good cook. Tell Pa Modou that he must now be the Fula’s eldest son with these cooking skills, no doubt honed during bachelor years 🙂 Love to you all. Stay strong. By now, you are halfway there!